This is a blog about ice. That’s right – ice! Other topics will probably work their way in here (namely, SPACE! ), but I’ll try to keep more or less on topic. So: ice. The same stuff that was in your soda at lunch, yet at the scale of planets… well, I’m getting a little ahead of myself. I’m a graduate student who lives in “The Ice Lab:” a small, windowless room in the basement of the Geochemistry building, full of things that sow unspeakable terror in the hearts of ice samples everywhere. When grown up ice samples want their little ice samples to behave, they threaten to send them to my lab. It is here that I slowly, relentlessly, crush ice. Very slowly: at about 10-5 millimeters per second. The pressure and temperature at which I do so are chosen to elicit a specific response from the ice, which I carefully measure before taking the experiment apart and examining the ice under an electron microscope. I am looking for “subgrain boundaries” – the alignment of tiny defects within ice crystals – and seek to link their size to the rate at which the ice dissipates energy. Here is where the planets come in. Why do we care about how ice dissipates energy? There are many moons in the Outer Solar System – orbiting Jupiter, Saturn, Uranus, and Neptune – that are completely encased in ice. 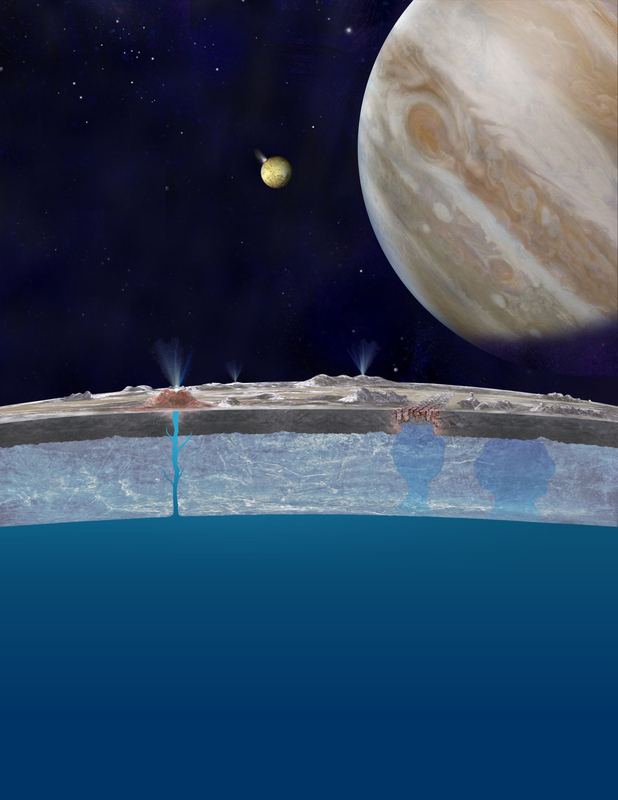 We even have spacecraft data which tell us that beneath the ice, some of these moons have liquid oceans. Water, tens of kilometers deep! To maintain liquid water through billions of years in the utter cold of the Outer Solar System, though, these moons need a heat source. One such source is the dissipation of tides inside the ice. When planetary scientists try to model the amount of heating occurring inside the ice shells, though, they are stymied by an incomplete knowledge of what causes dissipation (a.k.a. attenuation) at the extremely low frequency of this “tidal forcing.” Much of our knowledge comes from studies of attenuation at frequencies similar to that of earthquakes – because understanding seismic-frequency attenuation helps us interpret seismic returns from deep inside the Earth! – but planetary scientists must take that data and extrapolate it to the conditions of an icy moon, across huge differences in frequency. Such extrapolations are dangerous in science, especially when we don’t quite understand the processes we are trying to model. This is where my lab work comes into play. By performing attenuation experiments on ice that has been slowly deformed under a constant weight (a process called “creep,” which is how we expect the interiors of these moons to deform) I can then take that ice, put it under an electron microscope, and look at the crystal structure related to the measured attenuation. Hopefully, this will give me a more complete picture of the microscopic processes causing attenuation at tidal frequencies, allowing planetary scientists to model the (very macroscopic) processes occurring inside moons in the Outer Solar System. I’ll try to update this blog as often as possible on what it’s like to live and work in the Ice Lab, and the fates of my samples as they are slowly and steadily tortured. I hope that you enjoy learning a little bit about the science of ice! Next Making Ice – Mother Nature makes it look so easy!